While we all know the old adage of the bride being a few fashionable minutes late for her wedding, with so much that goes on behind the scenes on the morning of the wedding, it’s not surprising that time can run away! 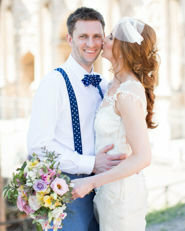 Thankfully, being in many brides’ (and grooms’) houses on the morning of their weddings means that I’ve just about seen it all and thankfully, I’ve used this experience to put together my top tips to ensure a smooth running, stress free morning so that you get down that aisle both on time and in style. In all the excitement, you might not have the best night’s sleep the night before your wedding but that doesn’t mean you shouldn’t try to unwind. Plan a nice, relaxing evening with your family or bridesmaids. If this involves carrying out at home beauty treatments, stick to your usual skincare routine. An unwanted reaction to something new is definitely not needed. If the nerves kick in, don’t use them as a reason not to eat. Remember that it will be quite some time before you sit down to your meal and with an early start and an action packed day ahead, never has it been more important to eat a good breakfast. It’s also a good idea to have bottles of water on-hand and a snacks supply in case of emergency. Speaking of emergencies, it’s a good idea to create a handy emergency kit in advance. Make sure this kit is packed full of all those little things which you might need. Here’s a few ideas to get you started; hair clips, safety pins, needle and white thread, super glue, baby wipes, cotton wool, hairspray, heel grips and plasters. It’s also a good idea to prepare a list of contact numbers for all your suppliers to allow you to get in touch easily. For hair and make-up, it’s always advisable to wear something which you can easily slip out of and which unzips at the front. Don’t wear anything which needs to be removed over your head to avoid risking damage to your hair or make-up. In all the excitement of the wedding morning, it’s easy to forget to do the little tasks that you do on a daily basis. Don’t forget to put in your contact lenses, brush your teeth, put deodorant and perfume on, take any medication and go to the loo (yes, really!). It might seem frivolous but you’d be surprised at the number of people who forget to remove labels. Thankfully clothing labels can be easily removed but those annoying, sticky labels on the bottoms of shoes can wreak havoc! Forgotten labels and the sticky substance left behind looks unsightly in photos so take a few minutes the day before the wedding and check for labels. It’ll save you precious time on your wedding morning. Often with so many people in one house things can get a little untidy, which is fully understandable. If you are having photos taken in your home, ensure you keep one room (preferably with natural light), tidy. This will serve as the perfect base for all those stunning detail shots. In this room, hang your dress and bridesmaid dresses and keep all your accessories here too. This means I can snap away, leaving you to your uninterrupted wedding prep. When hanging up dresses, I always love when these are displayed on co-ordinating hangers. Wooden and padded hangers are ideal but personalised hangers are even better! These will add personality and set the scene for a stunning photograph. Personalised hangers can be easily sourced online. Check out these ones from Not On The High Street. With white traditionally being the colour choice of shirts for grooms I’ve often witnessed how congratulatory hugs at the receiving line can lead to make-up on collars. In this case, I’d recommend having a spare shirt handy to allow you to change into for photographs before the meal. If you are not imposing a social media ban at your wedding, I’d recommend letting people know if you’d prefer photos not to be uploaded to social media. On a few occasions photos of the bride as she is leaving the house have ended up on Facebook and so seen by the groom before he sees his bride in person. While I always recommend letting everyone snap away, our advice is to not ruin the surprise by letting guests know not to share photos until after the service. For anyone who’s snap happy, make sure phones are fully charged with plenty of storage to avoid that sinking feeling of that little flashing red light. The day before the wedding, think of all the little tasks which need carried out on the morning. Write these up as a list and delegate roles so everyone knows who is responsible for what. Tick off what’s been completed so you can clearly see what actions are left. This helps limit any unwanted surprises and keeps everything perfectly in order. Don’t forget that you will be staying overnight in the hotel and you will need to pack everything you’ll need to wake up on your first day as Mr & Mrs, including the bags to store your wedding dress and the men’s suits. The best way to ensure a stress-free, flawless wedding morning routine, is with a simple schedule. This will help everything run smoothly on the morning, ensuring you arrive on both time and in style. While this isn’t a strict guideline, I’ve put together a handy hour-by-hour plan to ensure everything runs like clockwork. In this example, the wedding is starting at 1pm so you can adjust according to whether your ceremony is earlier or later. It’s highly likely you’ll be awake before this as the excitement builds, but it’s a good time to be up and having breakfast. Go for something light, but filling and no more than one glass of champagne is advisable. Ensure your bridesmaids have arrived with you, wearing clothing which is easily removed and which doesn’t come off over their heads. Your hair and make-up team should also be here and set up, ready to begin. When it comes to hair, allow one hour for the bride. The bridesmaids’ hair will take approximately 30 minutes each so if you have quite a large bridal party, you’ll need to plan an earlier start time. For make-up, again, on average, allow one hour for the bride and 45 minutes per bridesmaid. During this time, remember to have a snack and drink plenty of water. I will usually be arriving during this time so that I have plenty of time to capture any detail shots such as your dress, shoes and accessories. All hair and makeup should now be completed and it’s time for your bridesmaids to get into their dresses. If you have purchased gifts for them (especially if you want them to wear them today), now is the perfect time to present them. You should also ask someone (with clean hands) to help you into your dress. When you collect your dress from your boutique, it’s a good idea to bring along whoever will be helping you into your dress so that they can see how it is done correctly. Once you are fully dressed and accessorised, I would love to take some shots of you with both your family and your bridesmaids, as well as on your own, before you leave for your venue. Groom, best man and ushers arrive at the ceremony to welcome guests. Bridesmaids arrive, followed shortly by the bride and her father. 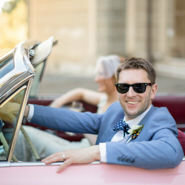 Hopefully this guide will help you plan your wedding morning so that it runs as smoothly as possible and you can arrive on time and relaxed, ready to tie the knot and start your life as Mr & Mrs! If you have any questions about the timetable of your day feel free to give me a call or email so that I can discuss it with you, and I always contact my couples a few days before their big day to confirm the last minute details and discuss the running order of your day your wedding day so that I can do everything possible to make your day as perfect as possible!